Add these ingredients to a pitcher of water (filtered is best) and let sit overnight in the fridge. In the morning you’ll have a delicious, healthy flavored water! A classic recipe for water includes cucumber. Switch it up by using lime and basil instead for a boost of flavor and vitamin C and iron. If you don’t like limes, strawberries are a good swap to use with basil. If you like a little spice in your life, add some jalapenos to your water. It might sound strange but the watermelon will tone down the spiciness and add some sweetness, not to mention vitamins A and C.
As fall approaches, apples and cinnamon is an amazing flavor combo. It works well in water too. Add cinnamon sticks, ground cinnamon, and apples to your water for a fall drink that is low in calories and helps maintain an even blood sugar. If you love the classic orange cream flavor, try adding orange slices and vanilla bean or vanilla extract to your water. Both contain healthy antioxidants. If you love sangria or mojitos, try this fruity combo for a healthy alternative to an alcoholic drink. Add your favorite frozen fruit to your water to keep it cold and flavored. Do you love or hate water? 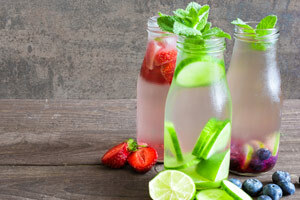 Which flavored water recipe makes your mouth water? Share with us!